Extract of tangerine in an oil free cream, consisting of Water (Aqua), Glyceryl Stearate, Behenyl Alcohol, Palmitic Acid, Stearic Acid, Lecithin, Lauryl Alcohol, Myristyl Alcohol, Cetyl Alcohol, C12-15 Alkyl Benzoate, Isohexadecane, Glycerin, Magnesium Aluminum Silicate, Cyclomethicone, Dimethicone Copolyol, Xanthan gum, Myristyl Myristate, Methylparaben, DMDM Hydantoin (and) Iodopropynyl Butylcarbamate, Propylparaben, Tetrasodium EDTA , Triethanolamine. This stuff is awesome. It seems expensive at first glance but you use a very tiny amount per application so the tub lasts me around 4 - 5 months. It took 4 or 5 days for me to see the full effects. But it's a night and day difference. I shave my head and previously by the end of the day it would be an oil slick. But now I can go all day and not have issues. Excellent stuff. only thing that worked for me reduced oil production non irritating pricey at $30 (after shipping) for a small container Like others with oily skin, I've tried almost everything. I'm a guy too so I couldn't use the whole milk of magnesia covered by makeup trick. Oil control moisturizers would work for about 30 minutes and then my skin would be more oily than ever. Initially, the product didn't work wonderfully, it was a hundred times better than anything else I tried but I did have to reapply after about 4 hours. I was pretty satisfied but after about 2 weeks of consistent, daily use I noticed my skin was less oily even upon waking up before applying. I should also note I've been on the regimen for over a year now and it doesn't irritate or cause any pimples. Additionally, it's a little pricey but if you suffer from an extremely oily t-zone like me, you'd pay anything to get rid of the embarrassment it causes. Best product EVER for oil control! Reduces Oiliness Doesn't Irritate Skin Awesome customer service None! I've tried them all - astringents, acne treatments, diet, powder, blotting pads. This product is helps without irritating my skin or causing redness. The customer service team at Sana Fela are very nice too - I emailed with questions before I bought. They are informative and supportive, return emails, and are not pushy at all. Smells great Moisturizes Lasts a while and really works I used to have really oily skin, to the point where I wouldn't want to touch my face in the morning before I washed it and I'd look like an oil slick in the afternoon. Within a few days of using max oil control my skin was less oily and over time the oiliness decreased so significantly that the results would last for a while even if I didn't use the cream every day! And the best part: the active ingredient is natural, so no skin irritation. Shine Free Max is the BEST product out there! Doesn't sting your skin, ever Easy t use IT WORKS!!! I have super sensitive and (ugghh) very oil skin. Shine free max is amazing, because it feels cool and light as you spread it on your skin, and it dries quickly. It doesn't sting at all, instead it feels very soothing. Nothing is better. After a number of applications, you realize that your skin is not greasy anymore! IT IS THE BEST!!!! Greatly reduces the oiliness of my face. It even reduced the size of the pores, especially in nose area. Absorbs quickly, so using it is not an issue, even for a guy (at night). Great stuff. The only thing that has really worked for me. This is an easy to use product that feels clean on my skin doesn't irritate. It definitely keeps my skin matte. I use this every day because it is the only product that really works. -Tightens your pores - makes your skin look smooth -Stops oil production without drying your skin -Easy to use every morning/night -Light, clean feeling cream -No more blotting! Takes a few days to work - its a cumulative effect. Once you try it - you will always want to use it! Sana Fela MAX is awesome. I know it works because after using it for a long time, I became used to my skin being non-oily, and stopped using it for a while. Then my skin became really oily again - so I ordered some more. Now I am back to using it again, and my skin is not oily anymore! (Thank God!) It's the BEST - I just ordered two jars today, so I won't run out again! I have an oily T-Zone, and this is the only product I've found that works. I'm a guy, and this smells like oranges.... but it's not that bad. It works. I like this product very much! It works really well. Within just a few days, my skin was way less oily. Love it! I'm telling friends in High School who have complimented my skin about Shine Free Max. If you type 'THHS' in the discount code box, you get free shipping. A little goes a long way, and this orangy-smelling cream both moisturizes my face and makes it less oily! It helps with my acne a little, too! 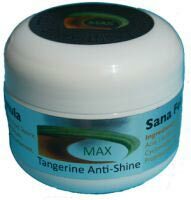 I cringe at the thought of ever NOT using Sana Fela Shine Free MAX!